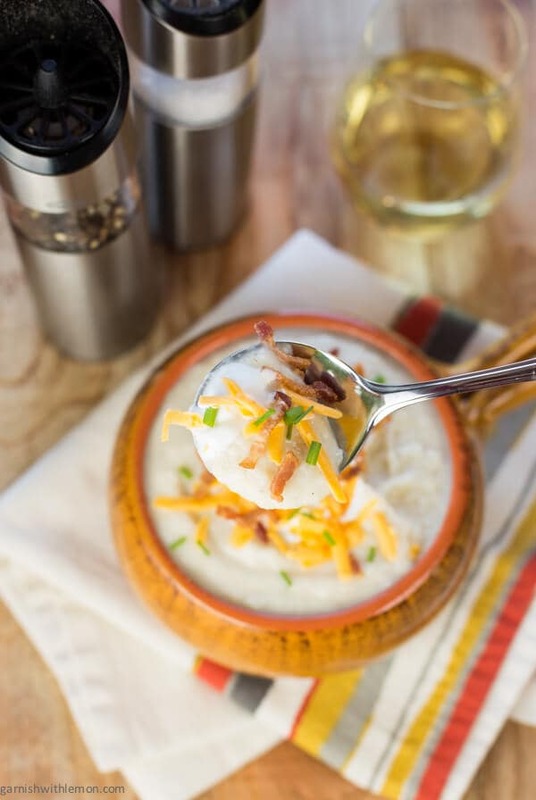 This easy Baked Potato Soup is pure cold weather comfort food. Yep, you guessed it; my soup craving hit again. It’s pretty much a given that whenever the temperatures fall below freezing that I start cranking out homemade soup. It’s my version of an electric blanket (although I think that might be nice, too, given the recent cold). This month I took a crack at Baked Potato Soup, because nothing says comfort food like a baked potato loaded with your favorite toppings. You can bake your potatoes any way you like for this soup – oven or microwave – but I opted to save time and use the microwave. After the potatoes cooled, I used the smaller of my super handy OXO fruit scoops to carve the baked potatoes out of their skins. So slick! The scoop has a thinner edge than a regular spoon which made it removing the potato guts go much more quickly. Garnish your soup with the same toppings you enjoy on your baked potatoes. For me, this means bacon, sour cream, sharp cheddar cheese and garlicky chives. And maybe a little extra bacon – well, because, bacon. This Baked Potato Soup is a peace offering to all of my snowed-in, sick-of-winter, cold-hating friends out there who vow to move to warmer climes next year. No, it doesn’t bring sandy beaches and palm trees to your home, but it’s amazing how a belly-warming soup can give you a momentary reprieve from cursing Mother Nature. Momentary, yes, but it’s a darn tasty moment. Place bacon in a dutch oven over medium-low heat. Cook bacon until fat renders and bits are crispy, about 10-12 minutes. Remove bacon from pan and reserve. Increase heat to medium, add onions to pan and cook until onions are translucent, about 10 minutes. Add potatoes and chicken broth to the pan. Bring to a boil, cover and reduce heat. Simmer for another 10 minutes. Stir in milk, sour cream, salt and pepper. Using an immersion blender, puree to desired consistency. (Alternately, you can puree it in batches using a blender.) Check seasoning and adjust as desired. Serve with cheddar cheese, chopped chives, cooked bacon bits and extra sour cream. Soup? Did someone say soup? Our weather is warm and still, I want your soup for dinner! Soup has that effect on me, too, Dorothy. I want it all the time! The weather here is horrible today and this soup looks perfect to warm us up. Ingredients I already have, too! Going to look at some of your other soup recipes, too–they look wonderful. 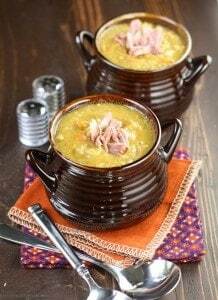 Split pea is one of my favs! Me, too, Carol. That’s another fave. With all this seriously cold weather, this is exactly the kind of supper I want to have. I’ve got some potatoes in my kitchen that may turn into this later today! Bummer about the dental work, but fantastic opportunity for soup binge eating! On cold days like these all I want is a little warmth! 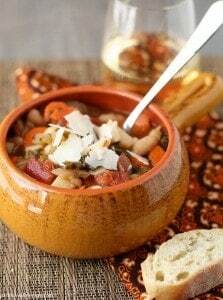 This soup is THE perfect idea for a cold winter night! I will be warming up with this soup soon!! Thank you for sharing! Hope you enjoy it, Brandy. Stay warm! This is the perfect combo, love the bread bowl, potatoes, cheese and bacon wow I am hungry now! 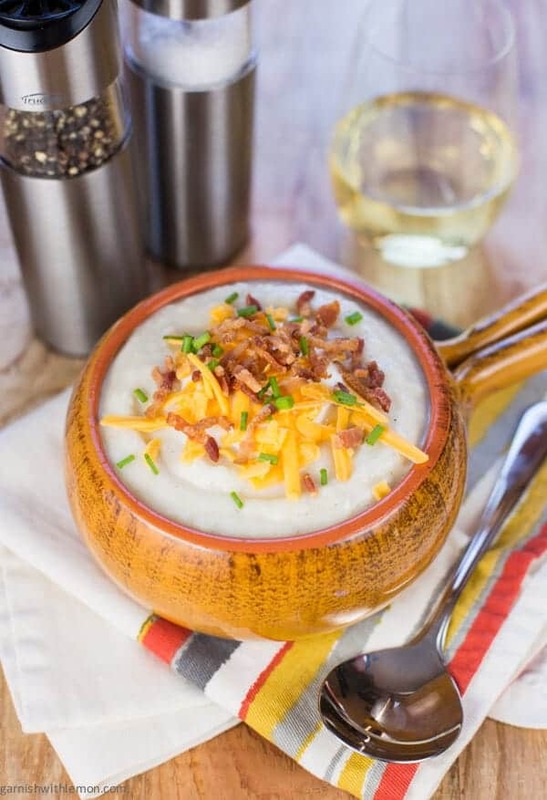 Anna, your Baked Potato Soup looks incredibly tasty! Just what I need on a very chilly night like here in Indy right now. I like that you added sour cream right into the soup along with the milk, too. Saw this post earlier when I visited your contact page to send you a note. 🙂 Thank you for sharing and keep warm! Thanks, Lady! Sending warm thoughts your way! Creamy, cheesy and oh so comforting! 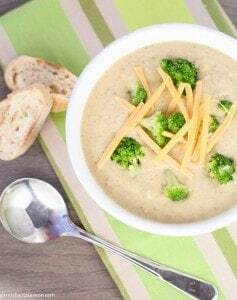 Lately I need as many ideas for soups as I can get with these freezing temperatures in the East coast. For sure this soup is a great contender to try soon! I love love love potato soup. This a tasty rendition of this fab soup.